A great prayer today! Went straight to my heart and my need for today! Thank you for your devotion today Mary. I am always thankful to Jesus for the grace He shows me each and every moment. Your words of encouragement hit the spot for me this morning. Jeremiah 29:11 is a life verse that Jesus has given me…..one of them. It is so good to be a child of God!! One day I really would so like to come and hear you all speak. Today as I was scrolling down your GIG site and saw your pic and saw you all smiling and just enjoying a moment together…..how freeing is that …that He would give us His word, His Son, His Holy Spirit and a choice. How freeing is that. Not only does He give us choice….but if we choose Him …..He is always with us and His plans are good and He is for us!! To live in freedom …to enjoy what He has given and share what He has done and given……Wow I just realized I set or let go of everything I love…..including myself….. A living sacrifice…..I am soo grateful for everything He has done for me. Psalm 40: 1-3 NIV that is another passage He has given me. He is soo good to me. Healing and restoring me…..and am grateful He is not finished with me yet!! I just Praise His Holy Name. Jesus!! Thank you all for your encouragement each day, Love in Christ, Karen H.
Thank you for this devotional and I look forward to the days to come and learning the other ways you will be sharing concerning how to deal with stress in a way that brings glory to God. I really need this right now and I praise God for being my shepherd and always providing! Thank you for the testimony of your life, be greatly blessed. You are so welcome, friend. 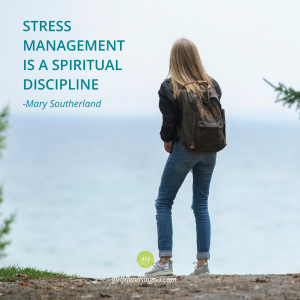 We are all in that same boat – learning to deal with stress in a way that honors God. Praying that His peace floods your soul! Blessings! Karen, I am so excited to see what God is doing in your life! He is a good, good Father … and we are indeed loved by Him. Blessings! Praise God! Prayer is the most powerful weapon and tool we have in the Christian life. That and the Word of God. God bless you as you continue to seek Him. thank you for this! i need to remember this anytime when stress comes my way. (mainly emotional). just need to keep reminding myself when there are days like that that to just remember whose i am. and nothing and no one will ever change that. We all need to keep reminding ourselves that God is with us … and that means His peace is with us.